In recent years, India has become a hub for prominent ISVs to open global development and delivery centers as a part of their growth strategy. In order to harness India’s tremendous potential to contribute to the world economy on a large scale, the Goverment of India recently launched the Make in India campaign, which has been designed with a special focus on facilitating investment and fostering innovation. 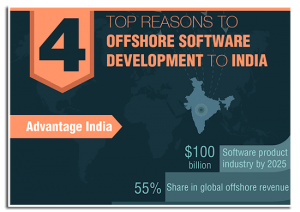 Download this infographic to know the four main reasons that have made India the world’s preferred offshoring location. Fill in the form and download this infographic now!